LOUISE CARVER will be performing live at Rhebokskloof Wine Estate near Paarl this month. You can win free tickets for this concert, so read on and take part in the competition with sending in the form below. 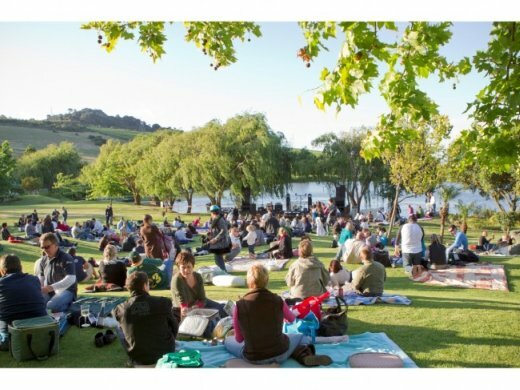 The popular singer and songwriter will be performing at Rhebokskloof Wine Estate in Paarl on Friday, 23 March 2012 as part of the estate’s ‘Theatre on the Lake’ concert series. Louise Carver is one of South Africa's most popular contemporary pop artists. Born and raised in Cape Town, she displayed musical talent at a young age. She received extensive vocal training and is also a trained classical pianist. As a singer and songwriter, she released her first single "It don't matter" in 1996, at age 17. In 2011 she was nominated for the SAMA (South African Music Awards) in the "Female Artist of the Year" category. Recently chosen as one of the Estée Lauder Supreme Women, chosen for being “supreme in their respective fields”, Louise Carver is certainly one of the "women to inspire the country". At the Rhebokskloof concert, fans can look forward to hearing her latest chart-topping singles ‘How You Gonna Do It’ and ‘Days Go By’, which the songstress will be performing on the night. Both singles, which will be on sale at the show, are included on her fifth album, a fusion between live instrumentation and electronic grooves, set for release later this year. Rhebokskloof is one of the older wine estates in the Paarl Winelands dating back to 1797. ’s sprawling lawns, overlooking its picturesque dam, make for the perfect setting for the estate’s ‘Theatre on the Lake’ concerts. Guests are invited to pack a picnic basket and blanket or pre-book a concert picnic basket by contacting the estate in advance. Rhebokskloof’s award winning wines as well as soft drinks will be on sale on the night. Regrettably no beverages are allowed to be brought into the venue. The venue of the concert is stunning as you can see also on this picture. Where? Rhebokskloof Wine Estate, Paarl. Here you will find a map to Rhebokskloof Wine Estate. When? Gates open at 17h00 and the show starts at 19h00. How much? Tickets are available from Computicket at R130 for adults and R65 for kids between the ages of 4 -12 years old. Event organization in partnership with Sony. Source: Thanks for the info and the offer of four free tickets to give away, i.e. two sets of double-tickets to Elize at Magna Carta PR. Competition closed. Winners were notified.